This page outlines the story of fluorine chemistry in Manchester at its various institutes and Universities. It is based on personal recollections of former members of staff and details taken from historical accounts. The story is far from complete and we will endevour to update it as time permits. Hopefully by telling this story we will be able to acknowledge the contributions made by many in Manchester to the study of the most reactive element in the periodic table! Johannes Carl Schorlemmer, born in Darmstadt in 1834, but became a naturalized Englishman in 1879 was firstly a laboratory assistant to Professor Henry Enfield Roscoe at Owens College, Manchester which was later to become the Victoria University of Manchester. 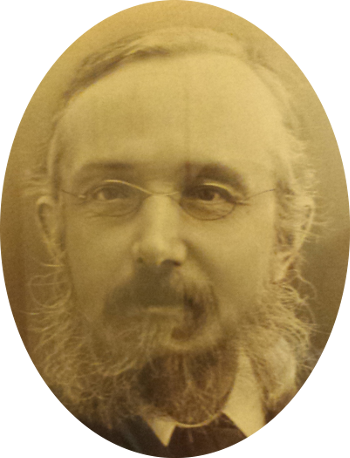 He subsequently became a Lecturer and Professor in Organic Chemistry (1874) - the first such chair position created in England. He was elected FRS in 1871 and published 60 papers. Schorlemmer was involved in a number of aspects of fluorine chemistry, which included working with HF, from which he received a serious burn, and subsequent scar, while working as Roscoe's personal assistant on a study of the relationship between boiling points and composition of various aqueous acids. This required distilling concentrated "fuming" nitric and hydrofluoric acids, soething that Roscoe noted in Schorlemmer's obituary that he did very well. It is also likely that Schorlemmer was involved in advising or directing the work of Sydney Young (1857-1938) in attempting to make fluoroalkyl compounds from the reaction of alkyl iodides with silver fluoride. By the way there is a huge amount of interesting trivia associated with both Roscoe and Schorlemmer. In the case of Roscoe these include the fact that he worked with Robert Bunsen - of Bunsen burner fame - was the uncle of Beatrix Potter, became an MP and subsequently the vice-chancellor of the University of London, and the Roscoe building at the University of Manchester is named after him. Meanwhile Schorlemmer was a close friend of Karl Marx and Friedrich Engles, both of whom used the slum-like factories and cottages along the Medlock river in central Manchester - later to be flattened and replaced with the precursor to UMIST - in coming up with their writing of The Condition of the Working Class in England. Robert Neville Haszeldine was born May 3rd in 1925. He attended Stockport Grammar School in Greater Manchester, before obtaining his degrees in Chemistry at The University of Birmingham. Subsequently he moved to the University of Cambridge where he was Assistant in Research in Organic Chemistry 1949-1951, a University Demonstrator in Organic and Inorganic Chemistry 1951-56 and Assistant Director or Research in 1956-57. He moved to a Chair and head of the Chemistry Department at UMIST in 1957. Ten years later he became Principal (vice-chancellor) of UMIST, a post he held until 1982. In his retirement he bought a 2 acre hillside garden at Great Langdale in Cumbria which was known for its plant collection, including being featured on the BBC's Gardener's World. There is a plant, Oxalis oregana Bob Haszeldine, named after him. He died on 13th October 2016, aged 91. On moving to "The Tech" (UMIST, as it later became) Bob Haszeldine started to set up the single largest academic fluorine chemistry group that the UK has ever known. He recruited young academics, such as Eric Banks (see below), Tony Tipping, Mike Barlow, David Taylor. He designed a new Chemistry Building, opened in 1968, that was divided into two parts, the Research Tower and a Teaching Block, that were linked by a bridge (and underpass) across Sackville Street. The top floor of the research tower (O floor) was specifically designed to house fluorine generators, electrochemical fluorination (ecf) cells and HF handling facilities. The basement included an extensive suite of autoclave facilities, and the link between the two buildings became the administrative centre of chemistry, and when Prof. Haszeldine became Principal of UMIST, of the central administration. A wide range of fluorine research was undertaken by the UMIST fluorine group, with a mixture of organic, inorganic, organometallic, radical and polymer chemistry being covered. During his scientific career he published extensively. Prof. Haszeldine received many honours in recognition of his work in fluorine chemistry, inclduing in 1994 the Moissan International Prize for Fluorine Chemistry, being elected a Fellow of The Royal Society, a DSc from The University of Birmingham. Ronald Eric Banks was born on 11th November 1932. He attended schools in the Stoke on Trent area and then moved to the University of Durham where he obtained his BSc and subsequently PhD. His PhD supervisor was Ken Musgrave. After a spell at the Imperial Smelting Company (ISC) in Avonmouth (near Bristol) he moved to the "Tech" (UMIST) in 1958 as part of Bob Haszeldine's embryionic Fluorine Chemistry Group. Eric remainded at Eric, moving through the academic ranks until being appointed Professor of Fluorine Chemistry. Eric retired in 2004, although continuing to work until his research students and contracts completed. Eric Banks' research areas included aspects of fluoroaromatic chemistry (such as the synthesis of hexafluorobenzene and pentafluoropyridine), fluorinated nitrogen compounds such as azides and nitrenes, the persistent radical species (known as magic radical) , fluoropolymers and N-F fluorinating agents. It is in the latter area that Eric made the greatest impact with the design and (with Air Products Inc) scale-up of F-TEDA-BF4, known as Selectfluor. This reagent is now produced on a multi-tonne scale and used as a safe, easy to handle electrophilic fluorinating (F+) agent particularly for the fluorination of steroids, especially fluticosone propionate, used in millions of inhalers and related medications around the world. For his work in designing this reagent Eric received the American Chemical Society's Creative Work in Fluorine Chemistry prize, and Air Products an R&D 100 prize for commercializing this technologically important product. Eric published ca. 260 research papers, over 30 patents and a number of text books concerned with fluorine chemistry, and the people involved in it. These books include "Fluorine Chemistry at the Millennium, Fascinated by Fluorine" in which Eric assembled an impressive list of international authors to describe the chemistry and personnel involved in many of the preceeding fluorine discoveries. 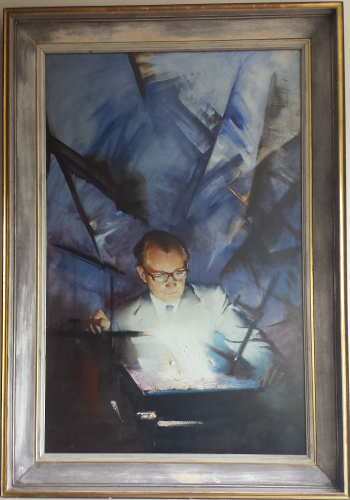 He was awarded a DSc in 1971 for "original contributions to knowledge of fluorocarbon chemistry".